OFFICE REOPENED 10/02/2017 - FROM IH 37 TAKE EAST SOUTHCROSS BLVD EXIT AND GO EAST ON SOUTHCROSS. OFFICE AT CORNER OF EAST SOUTHCROSS AND \n? PECAN VALLEY DRIVE. NEXT TO WALMART. The San Antonio Social Security office is located in San Antonio 78223. The following page includes information for this location like the office phone number, hours of operation and driving directions. If you have any interests or comments about your retirement benefits or are interested in making an appointment, call the following San Antonio Social Security office. The San Antonio Social Security office is located in San Antonio 78223. The following page contains information for this location like the office phone number, hours of operation and driving directions. 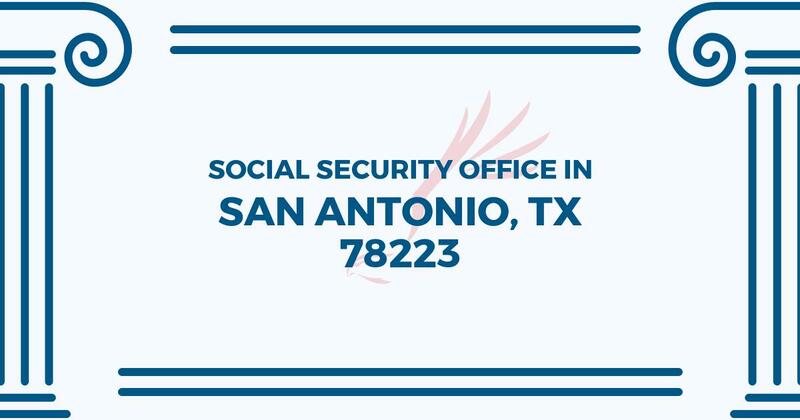 If you have any interests or comments about your Medicare benefits or are interested in arranging an appointment, call the following San Antonio Social Security office. Upon arrival the parking lot seems a little small fir all cases they handle although it was clean. Entering the building and it seem quite and peaceful. No children running around and yet it seemed kinda full theyre were enough chairs to accommodate the clientele. Staff was helpful and pleasant security guard greeted upon arrival. I thought i had entered a resort. All in all i had a pleasant visit it didnt seem like we waited long at all. Entering the building and it seem quite and peaceful. No children running around and yet it seemed kinda full theyre were enough chairs to accommodate the clientele. Staff was helpful and pleasant security guard greeted upon arrival. I thought i had entered a resort. All in all i had a pleasant visit it didnt seem like we waited long at all.